1. | Old Navy Chunky Heel: I rarely wear flats..rarely. So, my version is a chunky heel like this one from Old Navy. It's about time to upgrade my shoes situation, and I'm all about an option that doesn't break the bank. 2. | Sole Society Neckerchief: If you saw my blog post earlier this week, I love a good neckerchief. This one from Sole Society is light weight and perfect for those hotter days. 3. | IT Cosmetics CC Cream: I have been dying to try this CC Cream. After my first facial at Zona MedSpa (if you live in Phoenix - go see Chelsea! ), I realized I need a product that can play double (and in this case triple) duty as my moisturizer, sunscreen AND light foundation. I've heard nothing but good things about this product and am adding it to my shopping list. 4. | Ikea Rattan Headboard: I've been living in home remodel hell for the past year. I think the hardest part is knowing exactly what you want and then realizing how expensive it is to get that look. I have known for awhile that I want my guest room to play up on the desert vibe and have been searching for the perfect rattan headboard. I'm adding this Ikea one to the list to check out. 5. | Shein Two Piece Set: I love how two-piece sets look on so many different style bloggers, but I am so scared to try them myself. 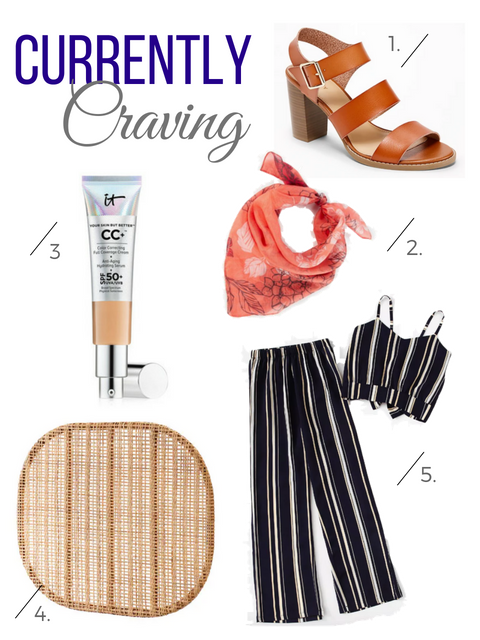 I saw this one on Shein and thought it was a good one to dip my toes into the trend.